Dirak is a leading and superior quality Sealing profile/EMI/RFI Gaskets manufacturers, India. We manufacture high-quality gaskets as per the instructions provided by our professionals at our production unit. Our gaskets are used for a wide range of applications in the automobile, industrial and medical sector. Dirak is specialized in manufacturing and supplying a high-quality range of Gaskets. Dirak EMI Gaskets are basically the EMI and EMC Shielding Gaskets that are highly conductive in nature. Dirak uses the high-quality raw material for manufacturing gasket materials, which has propelled Dirak to the best position among all the Sealing profile/EMI/RFI Gaskets manufacturers, India. 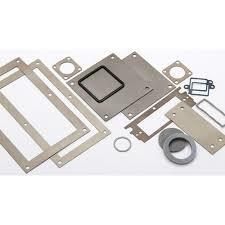 We at Dirak use high-end technology which provides a highly economical and quality solution for EMI shielding. Dirak Gaskets products help in making the electrical connections of doors and windows from all the sides. Our organization identified as one of the eminent providers of high-grade Neoprene Profiles suppliers and dealers in the market. These products are fabricated by best industry experts using the finest quality components. Contact us today! For more info on Sealing profile/EMI/RFI Gaskets manufacturers.